Please contact us for further details regarding the FAQ or for other questions not listed below. Q: What does “genki” mean and how is Genki HomeCare different from other home care services? A: The word “genki” in Japanese means energy, spirit, and well-being, something that we strive to provide each of our clients. Unlike many of our competitors, each caregiver is selected through a rigorous interview process and are given training from experts in the field. 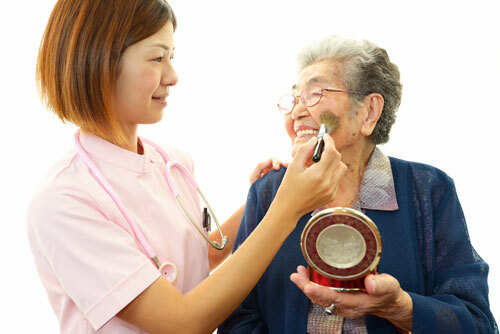 This ensures that Genki HomeCare can provide the highest quality home care services possible. Q: I have Long Term Care Insurance. Can I use this insurance to pay for the home care service? A: Your insurance should pay for home care, but since each plan is different, please contact your insurance company for specifics. Q: I wish to receive personal care service, but my income is limited to Social Security. Can I use Medicare or Medicaid? A: Unfortunately, the services that Genki HomeCare provides are non-medical, and therefore, Medicare and Medicaid cannot be used for our services. Q: I am over 80 years old and am afraid of driving. I need someone to drive me several times a month. For example, it usually takes 3 hours to see a doctor, or I spend about 2 hours for shopping. Your price list shows a minimum of four hours. Will I be able to use Genki HomeCare? A: Yes, we will provide services that take less than four hours, but the pricing may be slightly higher. We would be happy to calculate the exact price for you based on your needs. Q: My mother-in-law is extremely picky when it comes to caregivers. She has had many difficulties with caregivers from another organization. Could we meet several caregivers before we commit to the service? A: Home care staff selection is done by our coordinator based on specific requests from the client, and until client is completely satisfied with the selection, he or she can continue to request interviews with other Genki HomeCare caregivers. Q: My father is in a nursing home in San Diego. Though partially immobile, he does not have any dietary restrictions, and once in a while asks for food from a local Japanese restaurant. I now live in San Jose and cannot freely visit him to help him with his requests. Is it possible for Genki HomeCare to bring him Japanese meals several times a month? A: If the nursing home that he is currently at does not restrict outside food, we can certainly offer our services. Our services are not limited to those living in their own homes, but also those in senior care facilities.